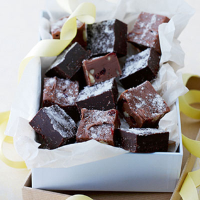 This homemade fudge is the ideal gift! You can make it with milk or plain chocolate - and really go to town on the packaging. Line a square tin measuring about 21cm x 21cm with parchment paper, creasing it into the corners. Break the chocolate into small pieces and place in a heatproof bowl. Add the condensed milk and place the bowl over a saucepan of gently simmering water, making sure the base of the bowl is not in contact with the water. Heat gently, stirring the chocolate until completely melted. Remove from the heat and stir in the pecans, cranberries, if using, icing sugar and vanilla extract until evenly combined. Spoon the mixture into the tin and level the surface with the back of the spoon. Chill for at least 2 hours until the fudge is firm. Lift out of the tin and remove the paper. Dust the surface lightly with the sugar. Using a sharp knife cut the fudge into small squares. Use Fiddes Payne Vanilla Sugar instead of plain sugar to dust the fudge. You can buy this in branch, or make your own by storing a couple of vanilla pods in with your golden caster sugar. To make chocolate-coconut fudge, add a 50g sachet of creamed coconut, chopped, when melting the chocolate. This recipe was first published in Fri Feb 01 00:00:00 GMT 2008.